A tornado of birds. In an instant the sky is a roiling mass of feathery white bodies, flying chaotically in all directions, up and away from the nests they had been occupying moments before. There is a cacophonous burst of noise, and then this fades out as the birds rise and circle the empty colony; or, almost empty colony. Because now, on the 2 acres occupied for months by the largest breeding colony of Caspian terns in the world, there stands a solitary bald eagle, ravenously tearing at the prey gripped tight in its talons: an adult Caspian tern that it plucked from the air in the midst of the flush. For 15 minutes the adult bald eagle dismantles the tern, feathers flying and delicate hollow bones crunching in its beak, pausing only to twist its head in all directions, stealing furtive glances at the terns wheeling in the sky above it. And then, as quickly as it appeared, the eagle departs, leaving a head, pieces of wings and a ring of plucked feathers as the only sign of the dramatic scene of predation that has just unfolded. As its massive wings beat the air and carry it over the channel and towards the mainland, it is replaced by hundreds of western and glaucous-winged gulls, systematically emptying the tern nests of their eggs while thousands of Caspian terns circle the colony, crying out, swooping down, and eventually dispersing until the world’s largest Caspian tern colony sits silent and still. 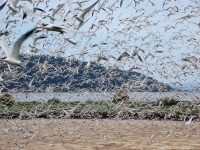 On May 20, the Caspian tern colony on East Sand Island, Oregon began experiencing consistent disturbances at sunset, in which the entire colony would suddenly abandon their nests and circle the colony, hesitant to re-land, and eventually abandon the colony all together, returning in the early morning hours. The timing of these events suggested that a mammalian predator was responsible, or possibly the resident peregrine falcon. However, on May 23, from our vigil in the observation blinds that ring the tern colony, the crew working on East Sand Island was shocked to witness an adult bald eagle fly through the colony, grab a Caspian tern and proceed to devour it on colony. The eagle quickly stripped the bird of feathers, cleaned it of meat and then crunched through its breast bone to devour the organs. 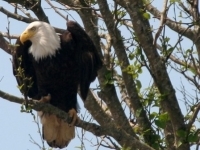 This process was fast and efficient, taking no more than 15 minutes, after which the eagle left the colony. The terns remained in the air over the colony throughout, moving together in a group that resembled schooling fish, making a circuit over the entire east end of the island, but never re-landing on the colony itself. The gulls, however, showed no hesitation to land on the colony once the eagle was gone, their ranks swelling from an initial handful to hundreds, sweeping over the colony to pluck tern eggs from the unattended nests. They gorged themselves until well after midnight, when the terns finally began to return. The scene was repeated the very next morning at 4:40 am. The terns had only recently resettled on the colony when an adult bald eagle swooped past the blind on the southern edge of the colony and pinned a tern to the ground, again making short work of its meal. This time, as the sky lightened around it, the gulls began to land while the eagle was still present on the colony, giving it a wide berth as they again set about devouring tern eggs whole, or cracking them in half and scooping up the yolk in their bills from the ground. After 10 minutes the eagle left the colony, carrying the remains of the tern in its talons and flying west towards the middle of the island. The terns were more willing to return to the colony in the day light and began to land around 5:15 am, running frantically around the colony searching for their mates and nests. This pattern continued for the next 9 days; each day the number of active nests was reduced and confined to a rapidly shrinking area in the center of the colony. The eagle was not always successful in its attempts at securing a meal, but the gulls always were. As fewer terns had nests to attend to, the flushes happened more frequently and the gulls were always ready to pick up where they had left off, doing a remarkable job of pinpointing the areas where tern eggs remained. Two tern eggs actually hatched during this 9-day period, but the resultant nestlings were soon devoured by gulls. Ultimately, on the morning of June 1, the last egg was eaten from the last active Caspian tern nest. In just under two weeks, a bald eagle and several hundred gulls eliminated close to 7,000 Caspian tern nests from East Sand Island. Though the terns continue to lay eggs, they remain nervous and uncommitted to their nests, and the eggs are taken by gulls almost as quickly as they are produced. As of June 14, the terns on East Sand Island have still not been able to successfully re-nest due to continued gull predation on eggs, ongoing eagle harassment, and intermittent predation by great horned owls and peregrine falcons. Though several thousand terns still occupy the colony site during the day and are actively scraping, copulating, and laying eggs, the terns have not been attached to a particular nest scrape for more than a few days, and they are still quick to flush and abandon the colony for hours at a time. We continue to monitor the behavior of these birds, and have even been lucky enough to find some of them at other colonies scattered throughout the Pacific Northwest. Although the collapse of this colony is an unfortunate blow to the Pacific coast population of Caspian terns, it is likely to be temporary, with terns reoccupying the East Sand Island colony site again next year, even if not this season. It is also a unique opportunity to witness the dynamics of a changing colony, and to gain insights into the behavior of breeding birds interrupted in the middle of the nesting season by intense predation pressure.